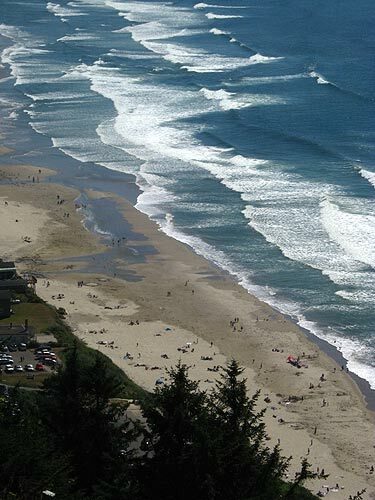 (Oceanside, Oregon) – One of Oregon's most astounding spots is one of its tiniest: Oceanside, along the Three Capes Loop. 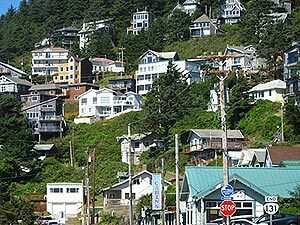 Calling it a diminutive village would almost be a grandiose overestimation of its size, probably barely a mile in length, if you count its neighborhood hills. It's a half-mile long if you count the road that wanders into a smattering of homes and even fewer motels. This pretty place is unbelievably crammed full of finds and revelations. But that's a whole other story. 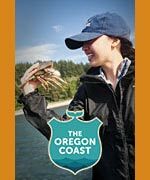 Expand your exploration a few hundred feet upwards and maybe a mile or two down the road and you have a dizzying array of extraordinary sights and secrets – especially a few vantage points that will change how you look at the Oregon coast. These are not just neighborhood hills, but "neighborhood thrills" as well. Keep on driving upwards, in a kind of spiral at times, and if the Fates have treated you well you'll bump into the top of the hill overlooking Oceanside. 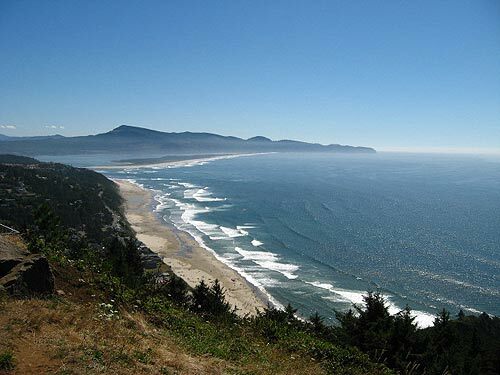 Suddenly you're looking down on the vast stretch of beach between here and Cape Lookout (photo at top), as well as gazing down at the tips of the Three Arch Rocks which seem to tower even at a distance from the vantage points of the beach. It is breathtaking up here. You are at an aerial view of Oceanside now, as if from a plane. One of the area's most striking components sits along this tight, winding gravel road, quite tucked away. 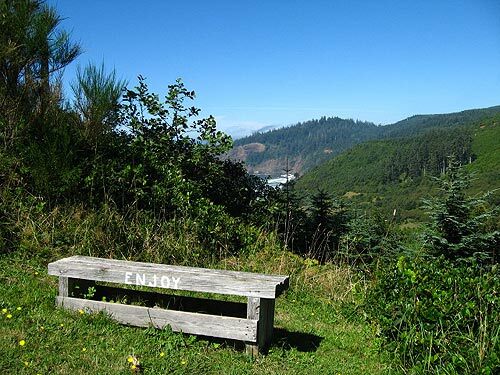 A single, simple bench with an even simpler inscription looks out at Oceanside, the hills to the east (formerly part of the infamous Tillamook Burn in the midcentury), and even just north to the secret little beach called Short Beah. 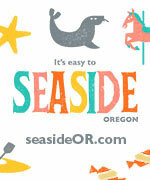 Short Beach is itself a host of myriad wonders and surprises. It never gets old. From a tiny pullout next to the highway you can look down on this tiny tract of beach, where a big basalt blob looks a bit like the one at Neskowin about 30 miles south. Get yourself a good pair of binoculars or a zoom lens and check out the tree atop the blob here, viewable in this way only from this high spot above the cove-like hidden beach. 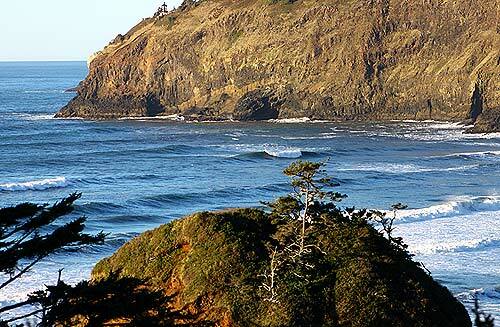 Lift your your optics up a tad and train them closely on Cape Meares in the distance. Here, you can see the Cape Meares Lighthouse from a whole different angle, and then follow the lines of the guardrails along the sides of the cliffs, marveling at this completely new way to see the cape. Oceanside sits about three miles south of Cape Meares along the Three Capes Loop, and about nine miles west of Tillamook. 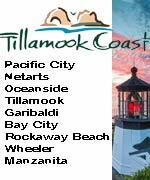 More on the area, including more details and directions, at the Three Capes Loop, Oceanside, Pacific City Virtual Tour, Map.